Some years back, a friend came out from the East Coast to go cougar hunting. The morning after he arrived, we set out early and were fortunate enough to strike a good track. By the time the hounds were out of hearing range, he was struggling to keep up with me as we climbed the mountain in pursuit. At first, I simply assumed he was out of shape, but within a couple of hours he was complaining of headache and shortness of breath. We were only at about 7,000 feet of elevation, but he lived at sea level. (Our Montana home sits at 5,000 feet.) I belatedly put my doctor hat on and realized that he was developing acute mountain sickness (AMS). As much as I hated to abandon the dogs and the track, which was a big one, I knew he had to descend, and that I couldn’t rely on him to make it on his own. I accompanied him back to my truck, drove him to my house, and picked up the dogs on the road that afternoon. In retrospect, I should have known better. Had he acclimatized for a day or two at my house, that hunt might have had a better ending. 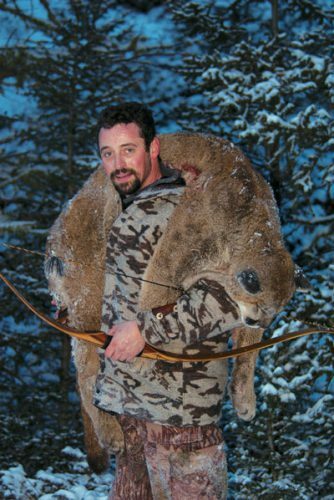 Alaska bowhunter Scott Leslie with a nice cat. A lion hunt can quickly get a hunter living at low altitude into heights capable of causing mountain sickness. Too many people regard altitude sickness as a problem limited to serious high-altitude climbers. Indeed, a reader living at sea level who was suddenly dropped on the top of Mt. Everest would likely be dead in a matter of minutes. But altitude sickness can develop at heights of 7,000’ in susceptible people, and nearly half of those sleeping at 10,000’ without acclimatization will develop some degree of AMS. Many of us have hunted at those elevations, and not just for sheep or goats. 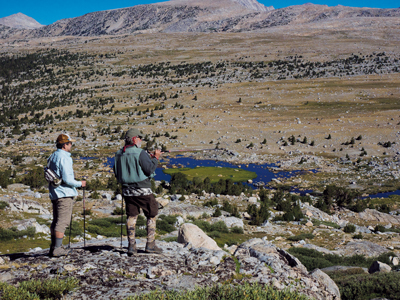 Some of the West’s best hunting for elk and mule deer takes place at those altitudes. At best, altitude sickness can make a hunt uncomfortable and unproductive. At worst, it can lead to expensive emergency evacuation, hospitalization, or even death. In most instances in which bowhunters are likely to encounter the problem, altitude sickness is largely or completely preventable. And if it does develop in yourself or a hunting partner, you need to be able to recognize it and take appropriate measures to keep it from progressing. Who needs to think about altitude sickness? A number of factors influence the likelihood that you will develop health problems on a high-country hunt. There is considerable variation among individuals in their susceptibility to the problem even when all other factors are equal. It’s not unusual for one member of a hunting party to develop early symptoms of AMS even when everyone else feels fine. If you have no experience hunting even as low as 7,000’, pay extra attention to the information that follows prior to a hunt at that elevation. If you have experienced altitude sickness before, acclimatize carefully and consider preventive medication before returning to the same altitude that caused problems before. While absolute height above sea level always influences the risk of sickness, several important factors can modify it. The most important is the degree of acclimatization. At any given altitude, someone who lives at sea level and ascends rapidly will be more susceptible to altitude sickness than someone who lives at 5,000’, as my friend learned on that cougar hunt. The human body begins to make a highly complicated series of adjustments to altitude with surprising speed. If you live at a low elevation and are planning to hunt sheep at 10,000’, even one or two days’ stay at an intermediate elevation will decrease your risk. The faster you ascend, the greater the risk, so plan to climb slowly once you leave the road, at least for the first few days. For complicated physiological reasons, the altitude at which you sleep may be more important than the maximum altitude to which you climb. If the mule deer are on a 10,000’ alpine plateau, plan on camping at 8,000 feet at least for the first two or three nights. Interestingly, an individual’s overall level of cardio-vascular fitness doesn’t seem to have much impact on the incidence of mountain sickness. Don’t ignore the issue just because you’re in good shape. Acute mountain sickness. A complete review of all the complex physiologic changes that play a role in mountain sickness is beyond the scope of this discussion. Suffice it to say that the key factor is the lower amount of oxygen in the air as altitude increases. This leads to lower levels of oxygen in the body, which in turn leads to faster breathing, lower levels of carbon dioxide in the blood, and a compensatory increase in the excretion of fluids and bicarbonate from the kidney. For the sake of simplicity, let’s leave it at that. Almost everyone experiences mild shortness of breath, “huffing and puffing,” and some fatigue with exertion at high altitudes. That’s normal. Early symptoms of AMS include headache (an especially important sign of impending trouble), nausea, loss of appetite, and disturbed sleep. These are signs that action is indicated, as discussed below. 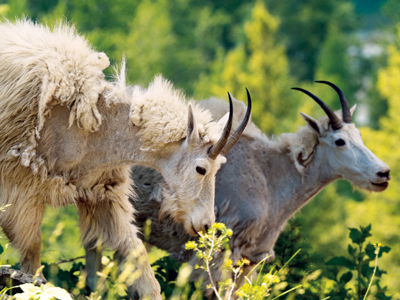 Goats are just one of many game species that inhabit heights capable of producing mountain sickness. As AMS progresses, impaired judgement, difficulty conversing and following directions, and especially loss of balance and unsteady walking develop. These are indications for an immediate descent to lower elevation. While the diagnosis of AMS is usually easy as long as you are aware of the possibility, the symptoms could be confused with carbon monoxide poisoning. If the victim has been using a heat source or fuel burning lamp inside a closed space like a backpack tent, remove him or her from the enclosure. At worst, AMS can advance to two serious conditions: high altitude pulmonary edema (HAPE), in which fluid accumulates in the lungs, and high altitude cerebral edema (HACE), or swelling of the brain. Both are medical emergencies that should be considered life threatening. Treatment in the field, other than descent, supportive care, and acetazolamide as discussed below, is complex and beyond the capacity of most hunting camps. The purpose of this article is to provide enough information and awareness to keep AMS from progressing that far. Prevention. An ounce of it really is worth a pound of cure, especially in the case of mountain sickness. Proper acclimatization is key. As a rough guideline, I would suggest staying one day at an elevation 2-3,000’ below your intended camping altitude for roughly every 3,000’ of difference between that height and your home. In other words, if you live at sea level and plan to hunt at 10,000’, spend two or three days at 7-8,000’ before starting to climb. Ascend slowly, perhaps limiting yourself to 2,000’ per day above 7,000’. Remember that it’s your sleeping altitude that matters most, so you can still climb on a stalk. Avoiding alcohol and sedatives will help prevent the sleep disturbance so common among new arrivals at elevation. It is important to stay well-hydrated, because gaining altitude always results in an increased loss of fluids through the kidneys. We have entered an age of suspicion toward conventional medical care and pharmaceuticals, not always without reason. I’ve certainly heard my share of enthusiasm for herbal and other “natural” remedies for almost everything, including altitude sickness. I can’t comment because data are lacking. However, I can tell you that acetazolamide, a mild diuretic that specifically acts to help the body retain bicarbonate, has been around forever, has an excellent safety record, and is definitely effective in both the prevention and treatment of AMS. It does require a prescription, but it is cheap when prescribed generically. I recommend that hunters who have experienced mountain sickness in the past, do not have time to acclimatize properly, or plan on hunting above 10,000’ discuss the pros and cons (and there aren’t many of the latter) with their personal physician prior to departure. Treatment. Advanced mountaineering expeditions may have access to oxygen and medications to treat severe AMS, HAPE, and HACE, but hunting camps won’t. People like us will have to rely on simpler means of treatment. The most important principle is descent, or at least an end to the climb. Mild AMS will often respond to staying where you are, or perhaps descending to a lower level to camp and sleep. Progressive AMS or its complications demand immediate descent whenever feasible. The good news is that dropping down as little as 1500’ may have immediate benefits. Because judgement, balance, and gait may be affected, the victim should be attended by hunting partners while descending. Move gradually, avoiding extreme exertion. If HAPE or HACE develop, medical evacuation may be necessary. As much as I dislike too much technology in the backcountry, this possibility makes a good argument for a sat phone or one of the smaller, less expensive devices like a Spot Gen that can be used to summon aid in a true emergency. I once found myself engaged in an argument with a passionate traditionalist who thought such devices spoiled the adventure component of backcountry hunting. While I acknowledged his point, I suggested that one should consider such devices not for oneself but for hunting partners, family, and the eventual rescuers themselves. I’ve seen too many friends of hunters, first responders, and SAR staff injured and even killed attempting backcountry rescues that could have been expedited or prevented with accurate, direct communications. As a final thought on worst case scenarios, remember that backcountry medical evacuations are expensive. I’ve carried evacuation insurance for years. It’s not expensive, and although I’ve never had to use it I recommend it to others who do the kind of things my friends and I like to do. None of this is meant to discourage anyone from hunting the high country. Many of my most memorable hunting experiences have taken place high in the mountains. By recognizing the possibility of altitude sickness and taking appropriate steps to prevent it, altitude sickness should remain a theoretical problem rather than an actual one on your next high-country hunt. A really, really good article! Thank you so much for this information. As a eastern hunter who was in the middle of planning a Colorado DIY archery elk hunt, happening upon this article proves quite timely. In doing some research on the effects of high altitude and epilepsy, I discovered many personal accounts of people, who quite stable, experiencing seizure activity after any substantial change in elevation, both ascent, and descent. My question is, are you aware of any published, peer reviewed information about the effects of altitude change and epilepsy?